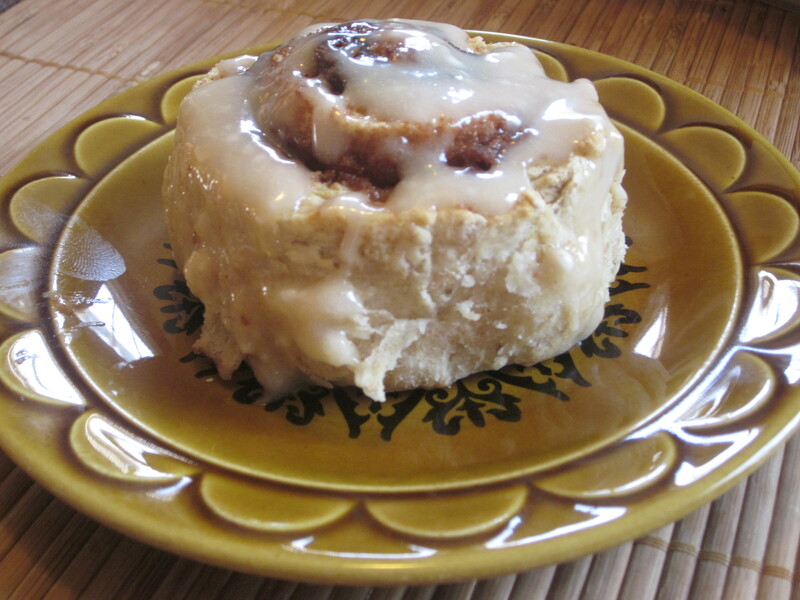 There is not much like homemade cinnamon rolls. 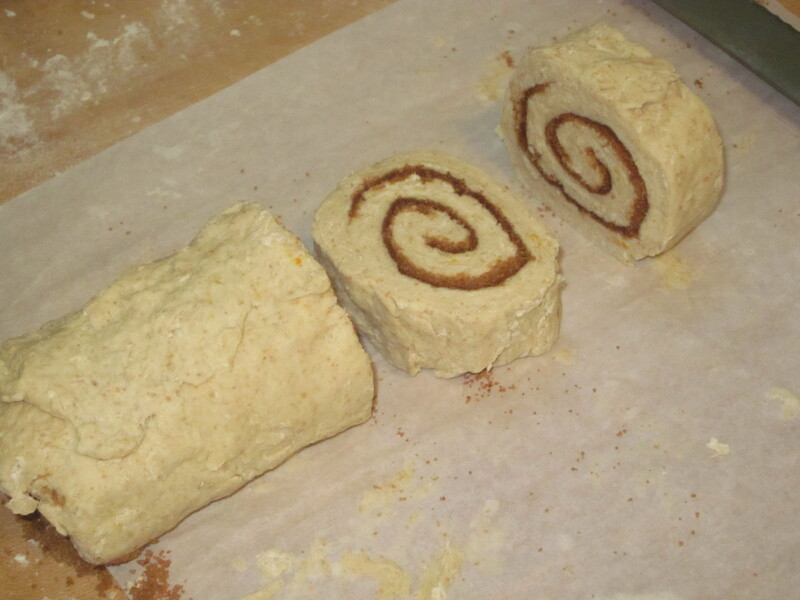 If you have the time, I strongly urge you to make the real deal yeast-risen kind… You can even prepare the dough at night and put it in the fridge to rise overnight, which bakes up beautiful & fresh in the morning… But… if you wake up on the weekend craving cinnamon rolls and you didn’t prepare the night before, well, dang. Sometimes you just have to figure something out!! Which is where these come in. So, I was kinda wingin’ it with these and they turned out really good! You can make them with any kind of milk… almond, soy or even coconut milk from a can… and you can choose between soy margarine or coconut oil for your fat. I have done them both ways and I recommend using coconut milk (for moistness) and soy margarine (for the flakiest pull-apart sections)! The taste was good when using the coconut oil but it didn’t make the sections flaky like when I used the soy butter. 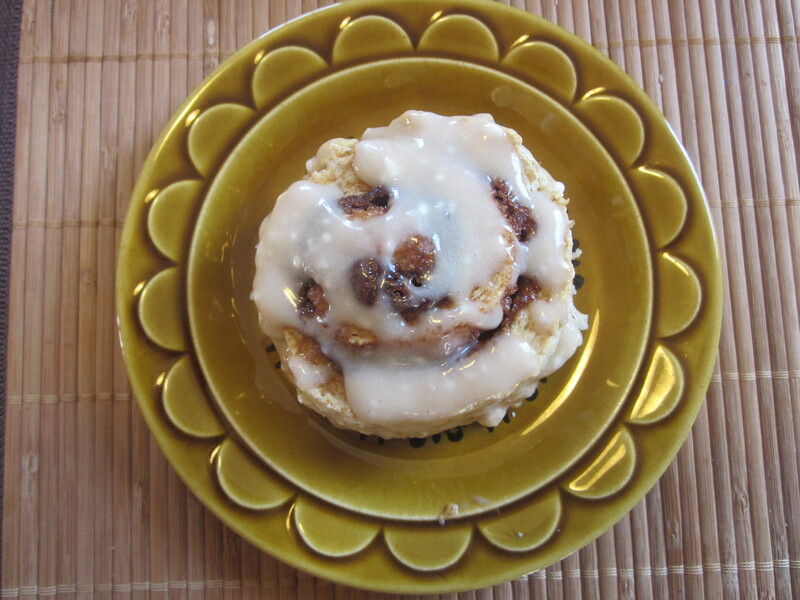 The oil made them almost muffin-y, which isn’t the cinnamon roll I was looking for. 1) Mix dry ingredients and cut in the margarine with a fork or with your fingers until well broken up. Pea sized bits are good. Little bits & pieces make for a yummy flaky dough! 2) In a separate bowl, mix your milk of choice, vanilla & oj. 3) Make a well in the center of the flour mixture and pour the liquids in. 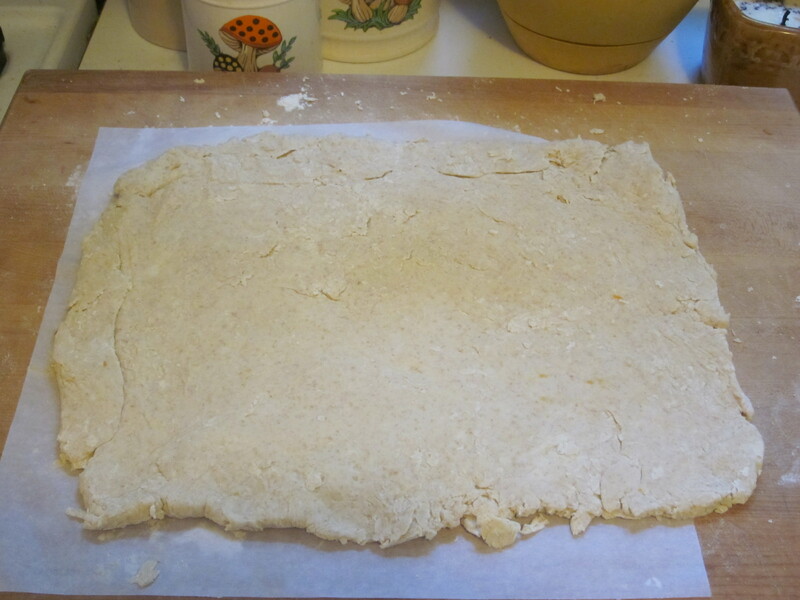 5) Gather the dough into a ball and roll it out into a large rectangle on a lightly floured surface. 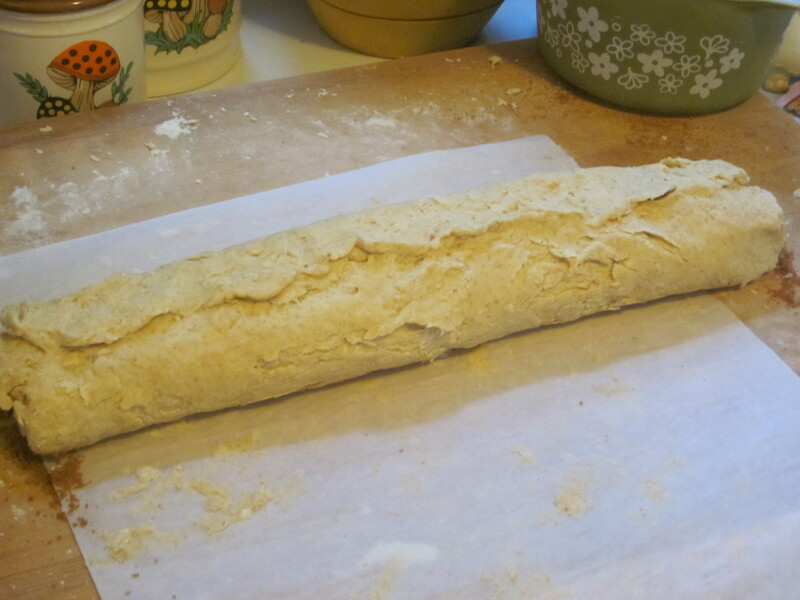 It really helps to roll it out on some lightly floured parchment if you have any. That way when you are rolling it into a tube, it doesn’t get stuck on the counter as easily. Roll it out to between 1/4″ – 1/2″ thick. 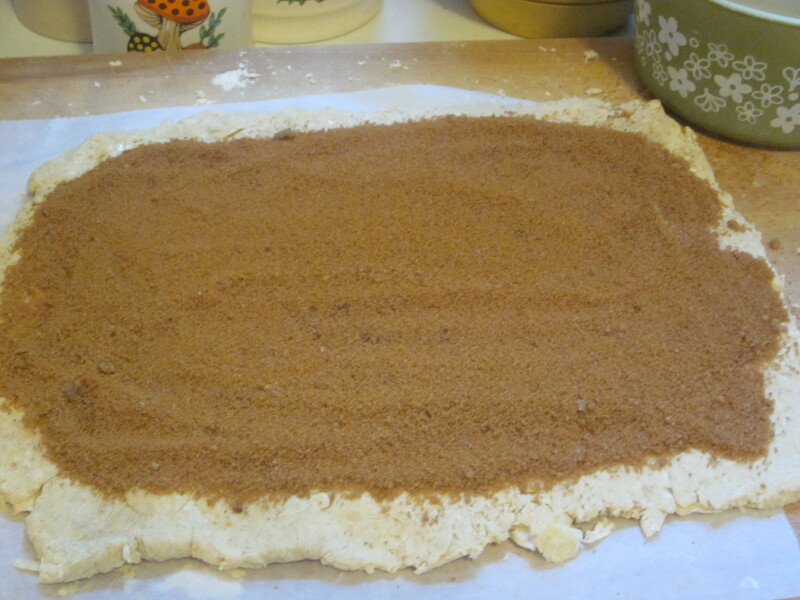 6) Brush the dough with the melted butter and sprinkle the cinnamon and sugar. Leave the very edge uncovered, so when you roll it up and pinch it together, it sticks easier. 7) Roll up carefully & pinch the seam together. Cut the tube into slices (A serrated knife or criss-crossing dental floss to cut the rounds is an easy technique!) Cut them into nice thick rounds… 1 1/2″ wide is good! Im gonna make it a point to shoot for 10 from now on. Slice it up into thick 1 1/2″ rounds! These rounds aren’t thick enough! Next time I’m making 10 instead of 12. 8) Space out evenly in a rectangular baking pan or squeeze them into a 9″ round dish. Bake at 450 for 12-14 min OR at 375 for 30 min. Always check them at minimum cooking time. (Tip: On my first attempt, I gave them too much room. I only put 7 in the pan. I guess I was thinking that way they could get really big, which they did, but the sides were too tough/overcooked from being separated – what I learned is that when they spread together and cook while touching, it makes them way more moist & smushy! So go ahead – jam them all in one pan together! 9) Let them cool for several minutes before frosting them with icing of choice. I suggest Frosting #2. These tasted great but there needed to be more rolls in the pan to keep the sides from being over-cooked. Ooooh! They are soooo goood! I strongly recommend making 10 rolls and squishing them all up in there for No-Rise Perfection! 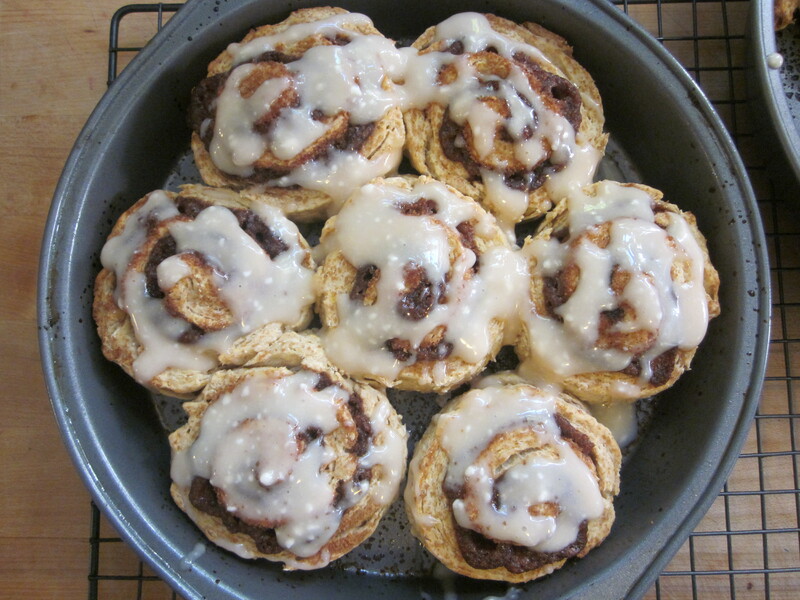 This entry was posted in baking, breads, breakfast, cakes & cookies, desserts, holidays, Vegan, vegetarian and tagged baking, breakfast, cinnamon rolls, easy cinnamon rolls, no-rise cinnamon rolls, quick cinnamon buns, Vegan, vegan breakfast, vegan cinnamon rolls, vegan cream cheese glaze, vegan no rise cinnamon rolls, vegetarian. Bookmark the permalink.